The arm in the human body is made up of three bones that join together to form a hinge joint called the elbow. The upper arm bone or humerus connects from the shoulder to the elbow forming the top of the hinge joint. The lower arm or forearm consists of two bones, the radius and the ulna. These bones connect the wrist to the elbow forming the bottom portion of the hinge joint. 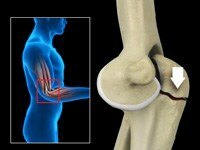 The elbow joint is actually three separate joints surrounded by a watertight sac called a joint capsule. 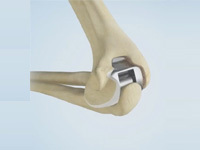 This capsule surrounds the elbow joint and contains lubricating fluid called synovial fluid. Ulnohumeral Joint is where movement between the ulna and humerus occurs. Radiohumeral Joint is where movement between the radius and humerus occurs. Proximal radioulnar Joint is where movement between the radius and ulna occurs. Our elbow is held in place and supported by various soft tissues. 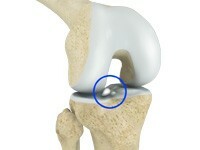 Shiny and smooth, cartilage allows smooth movement where two bones come in contact with each other. Tendons are soft tissue that connects muscles to bones to provide support. 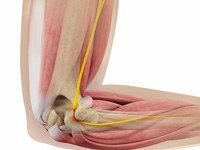 This tendon attaches the biceps muscle on the front of the arm to the radius allowing suppination, rotation of the elbow. This tendon attaches the triceps muscle on the back of the arm to the ulna bone allowing the elbow to straighten. This bony prominence located just above the elbow on the outside is where the forearm muscles that straighten the fingers and wrist come together in one tendon to attach to the humerus. This bony prominence located just above the elbow on the inside is where the muscles that bend the fingers and wrist come together in one tendon to attach to the humerus. Ligaments are strong rope like tissue that connects bones to other bones and help hold tendons in place providing stability to joints. 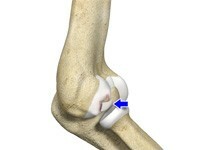 Ligaments around the elbow join to form a watertight sac called a joint capsule. This capsule surrounds the elbow joint and contains lubricating fluid called synovial fluid. There are four main ligaments in the elbow. Located on the inside of the elbow this ligament connects the ulna to the humerus. Located on the outside of the elbow this ligament connects the radius to the humerus. This ligament forms a ring around the head of the radius bone, holding it tight against the ulna. This ligament also connects the radius to the ulna. Muscles are fibrous tissue capable of contracting to cause body movement. 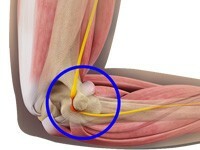 This is the large muscle on the front of the arm above the elbow that allows elbow suppination, rotation of the elbow. This is the large muscle on the back of the arm above the elbow enabling elbow extension, straightening of the elbow. 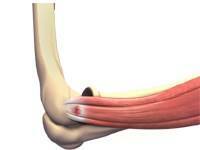 This muscle is the primary elbow flexor enabling bending of the elbow. It is located at the distal end of the humerus. These muscles of the forearm attach to the lateral epicondyle enabling extension of the hand and wrist. These muscles of the forearm attach to the medial epicondyle enabling flexion of the hand and wrist. Nerves are responsible for carrying signals back and forth from the brain to muscles in our body, enabling movement and sensation such as touch, pain, and hot or cold. All three nerves begin at the shoulder and travel down the arm across the elbow. The main vessel of the arm is the brachial artery. 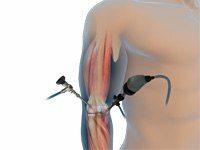 This artery travels across the inside of the elbow at the bend and then splits into two branches below the elbow. Radial Artery: The radial artery is the largest artery supplying the hand and wrist area. Traveling across the front of the wrist, nearest the thumb, it is this artery that is palpated when a pulse is counted at the wrist. Ulnar Artery: The ulnar artery travels next to the ulnar nerve through Guyon’s canal in the wrist. It supplies blood flow to the front of the hand, fingers and thumb. Bursae are small fluid filled sacs that decrease friction between tendons and bone or skin. Bursae contain special cells called synovial cells that secrete a lubricating fluid. 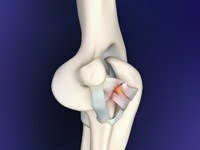 When this fluid becomes infected, a common painful condition known as Bursitis can develop. An athlete uses an overhand throw to achieve greater speed and distance. 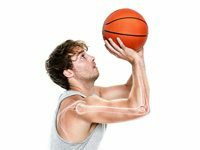 Repeated throwing in sports such as baseball and basketball can place a lot of stress on the joints of the arm, and lead to weakening and ultimately, injury to the structures in the elbow. The ulnar collateral ligament (UCL) is one of the main stabilizing ligaments in the elbow and is involved especially with overhead activities such as throwing and pitching. When this ligament is injured it can end a professional athletes career unless surgery is performed. 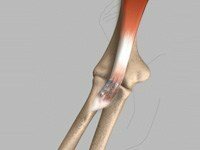 Loose bodies are small loose fragments of cartilage or a bone that float around the joint. 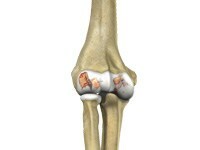 The loose bodies can cause pain, swelling, locking and catching of the joint. Loose bodies occur if there is bleeding within the joint, death of tissues lining the joints associated with tuberculosis, osteoarthritis, and rheumatoid arthritis. Nerves may get compressed or ‘pinched’ when pressure is exerted as a result of repetitive movement or holding the body in one position for a long time. Compression usually occurs between bones, ligaments and tendons present in various sites of the body. Nerves get inflamed when pressure is applied and do not function properly. Although the elbows are not weight-bearing joints, they are considered to be most important for the functioning of the upper limbs. Hence, even minor trauma or disease affecting the elbow may cause pain and limit the movements of the upper limbs. Arthritis is one of the common disease conditions affecting the elbow joint. 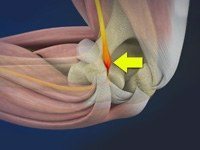 Cubital Tunnel Syndrome is a condition characterized by compression of the ulnar nerve in an area of the elbow called the cubital tunnel. The ulnar nerve travels down the back of the elbow behind the bony bump called the medial epicondyle, and through a passageway called the cubital tunnel. The biceps muscle is located in the front of your upper arm. It helps in bending your elbow, rotational movements of your forearm and maintaining stability in the shoulder joint. It has two tendons, one of which attaches it to the shoulder bone (proximal biceps tendon) and the other attaches it at the elbow (distal biceps tendon). The ulnar nerve is one of the 3 main nerves in the arm that travels down from the neck through a bony protuberance inside the elbow (medial epicondyle), under the muscles of the forearm and down the hand on the side of the palm, towards the little finger. The ulnar nerve helps in controlling most of the hand muscles which carry out fine movements as well as some bigger forearm muscles which help in making a strong grip. The biceps muscle is located in front of your upper arm. It helps in bending your elbow as well as in rotational movements of your forearm. Also, it helps to maintain stability in the shoulder joint. The biceps muscle has two tendons, one of which attaches it to the bone in the shoulder and the other attaches at the elbow. 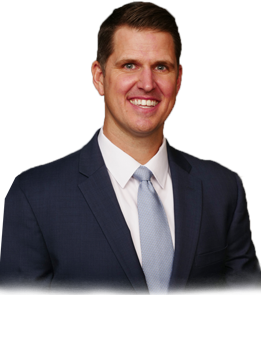 Elbow arthroscopy, also referred to as keyhole or minimally invasive surgery, is performed through tiny incisions to evaluate and treat several elbow conditions. The Elbow is a complex hinge joint formed by the articulation of three bones - humerus, radius and ulna. The upper arm bone or humerus connects the shoulder to the elbow forming the upper portion of the hinge joint. The lower arm consists of two bones, the radius and the ulna. Elbow Joint Replacement, also referred to as Total Elbow Arthroplasty is an operative procedure to treat the symptoms of arthritis that have not responded to non-surgical treatments. The arm in the human body is made up of three bones that join together to form a hinge joint called the elbow. The upper arm bone or humerus connects from the shoulder to the elbow forming the top of the hinge joint. 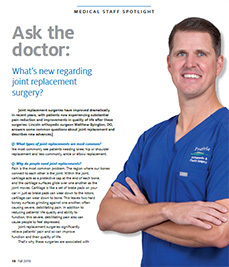 What's new regarding joint replacement surgery?